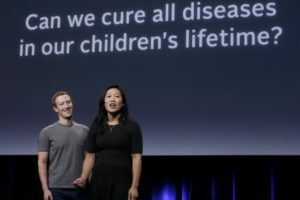 Facebook’s founder Mark Zuckerberg and his wife Priscilla Chan have pledged $3bn (£2.3bn) to fund medical research over the next decade. At a press conference in San Francisco, they said their ultimate goal was to “cure, prevent or manage all diseases by the end of the century”. The funds will be distributed by the Chan Zuckerberg Initiative, which they created in December 2015. Tech leaders are increasingly turning their attention to health. 1. Do you think it is possible to achieve the goals of Mr. Zuckerberg in the future? How do you think technology can help us tackle these diseases? 2. Infectious diseases can be passed from person to person. Please give some examples of infectious diseases suffered around the world. How are they managed, cured or prevented? 3. Noninfectious diseases do not spread and they are generally caused from genetics, environmental factors or deficiencies in nutrition. Please give some examples of non-infectious diseases. How are they managed, cured and prevented?